If Bandra’s charm could be codified, I guess this would be it. 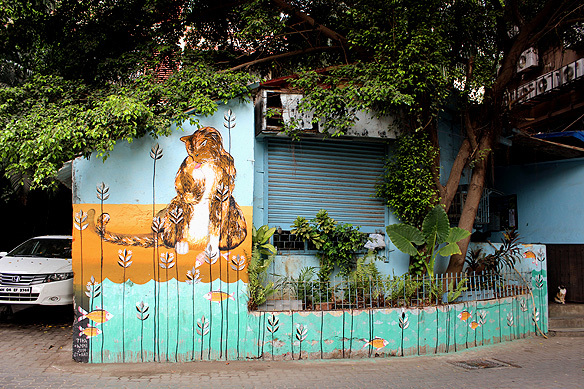 Cats and silver leaves—collaborative mural by Anpu Varkey (India) and Tika (Switzerland). 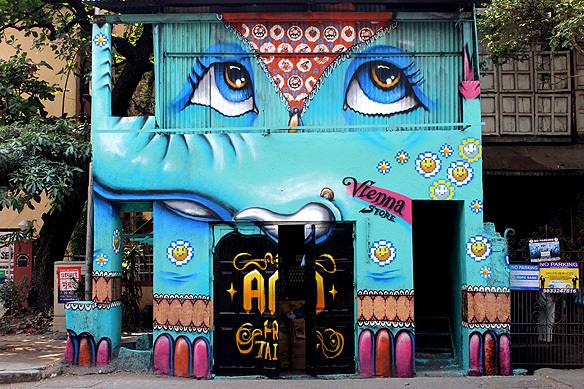 So what happens when 20 internationally renowned street artists from all over the world, and two passionate people from Delhi get together and decide to bring the power of art as a medium of creative expression to the streets of India, free and accessible to all? St+art happens. 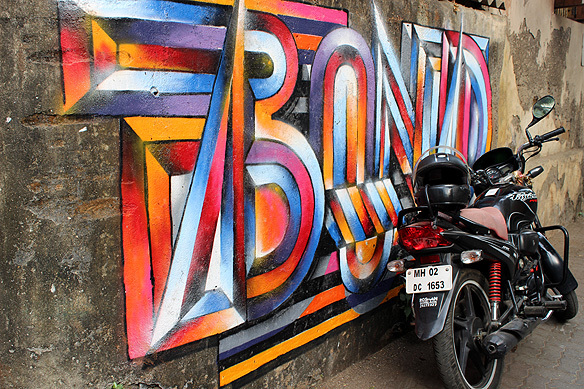 Bandra is no stranger to street art. 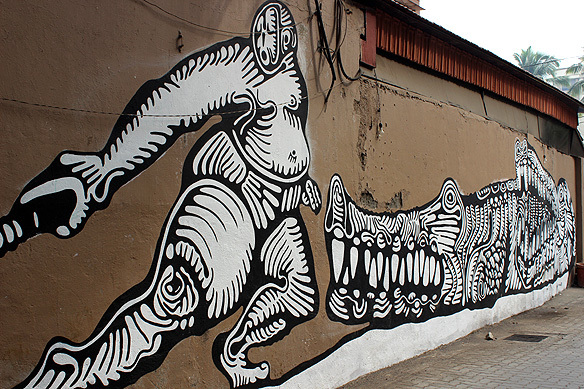 Its lanes burgeon with the works of both known and unknown street artists which I have written about in earlier posts; these include inkbrushnme and Ranjit Dahiya. The distinction this time, however, is the sheer scale, purpose and eclectic mix of styles which seeps into almost every part of this suburb, drawing inspiration from local structures, communities and materials like never before. From top: Amitabh Kumar (India) Much Much, which he states is an answer to the viewer’s confusion and imagination; Mural by Phomas (Germany) :D; Artistic map of Bond aka TruLuv (Germany), one of his many explorations of composing letters as creative expression. Site 2: Manuel Gonsalves Girls Hostel. Two walls. Two contrasting styles. On the left Seikon from Poland uses linear geometric patterns to create abstract art. Harshvardhan Kadam (India), aka inkbrushnme, meanwhile, narrates stories through poetic illustrations steeped in Indian mythology on the right wall. Site 3: Hotel Bandra Residency, Bandra Talao. 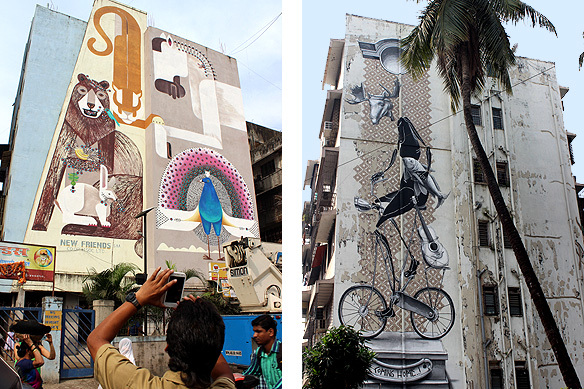 Addicted to heights, Anpu Varkey (India) has been painting monumental murals for over a decade now, seeing the streets in India as endless canvases for her to pour her creativity on to. Breaking away from her penchant for cats, Anpu, here dedicates Squeeze to Mumbai and its people. Left – Site 4: New Friends Building, Bazar Road. 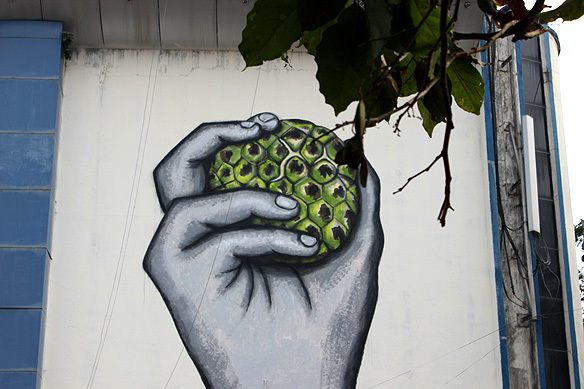 Tika (Maja Hurst), is a self-taught artist from Switzerland whose murals can be seen on buildings and streets from Cape Town to Rio de Janeiro, from Bangkok to Zürich. Entrenching herself in her mural location, her trademark style of vividly coloured fantastical animals covered in small hand cut silver tape leaves, explores today’s society and past traditions. Right – Site 5: Diamond Arc Building, Saint John Baptist Road. 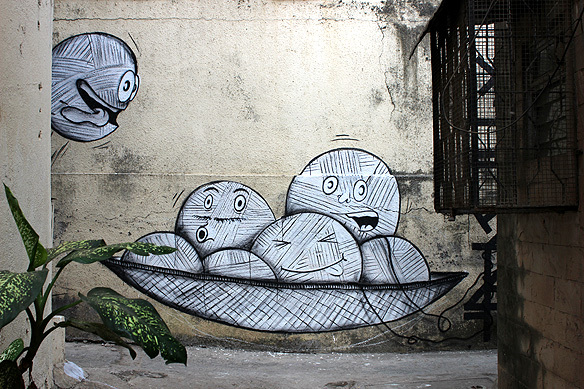 In contrast, German illustrator, Dome calls out to the suburb’s residents to enjoy Bandra’s simple pleasures through his surreal monochromatic painting Coming Home. Site 7: … Across the street. 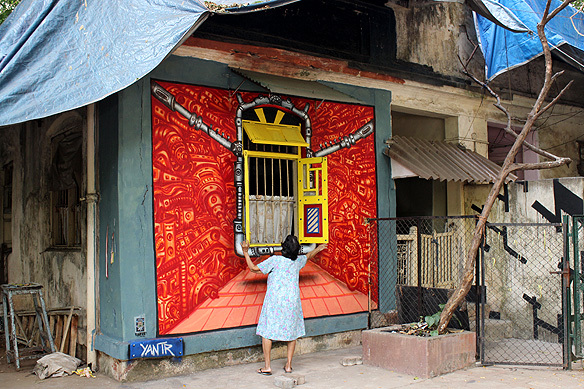 A Bandra resident proudly shows off her home’s 3D facade by Yantr (India) to passer-bys. Yantr, a Sanskrit word meaning ‘machine’, epitomizes the artist’s inimitable style revolving around the complexity of machines and organic forms which he uses as a medium to initiate debate on socio-political issues. Site 8: Mount Mary Steps. The collaborative street art of Tona and Tofu, amongst others, lines the walls of a weathered run down open space, turning the grounds into a riot of colour with its presence. Left – Site 9: Chimbai Village. Tucked away behind the village, facing the Arabian sea amidst lines of washing, playing children and fisherfolk going about their everyday tasks is Tona’s smiling girl child, as if part of the living pulsating life around her. Notes’ graffiti completes the picture. Site 11: Vienna Store, Hill Road. Likewise, little did anyone guess the sheer fairy-tale charm the structure would end up with when Ano (Taiwan) commenced his mural on the walls of a nondescript grocery store in Hill Road. Working with pixels as his basic element, Ano draws upon themes from video games for his art. This work is titled The Blue Elephant. Site 12: St. Jude Bakery, Waroda Road. For those who do not know, including me, St. Jude is the patron saint of lost causes. 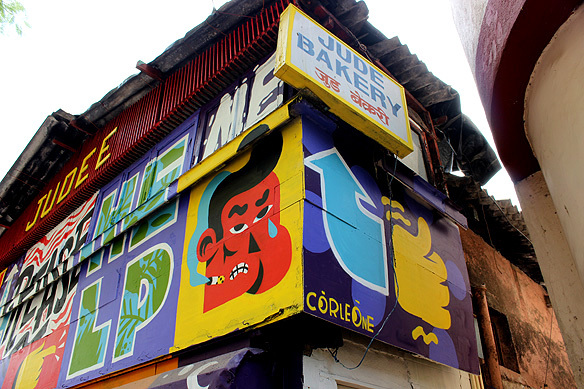 This became the mural theme for Akacorleone from Portugal, when painting the facade of the Bakery, which he conveys in a fun digital “visual” graffiti way! 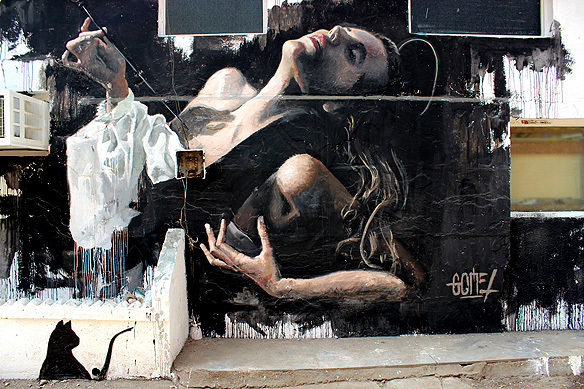 Walk around to the side wall… And a breathtakingly beautiful mural by Gomez (Italy) meets one. Reminiscent of Caravaggio, Gomez, earlier a graffiti artist, came back to the street art scene this year in June as a Renaissance street painter and is since painting in London, Rome, Berlin and Mumbai. Walk Finale: The walk ends in an exhibition at St. Jude Bakery where street art is, this time around, brought in. The result is no less spectacular. 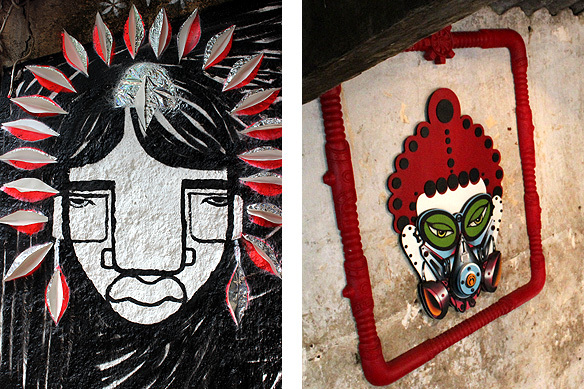 Above left: Mermaid (Detail) by Tika, from the street across; Above right: Operation Smiling Buddha by Yantr, inside the Bakery. The exhibition MAGMA Vol 1 is on from 15 November to 14 December, 2014, 11 am to 10 pm. 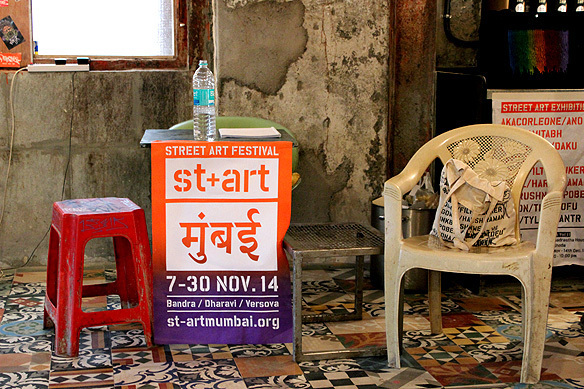 Post St+art Mumbai, St+art Delhi will be taking place in February 2015, in Shahpur Jat. Do be there! I will. 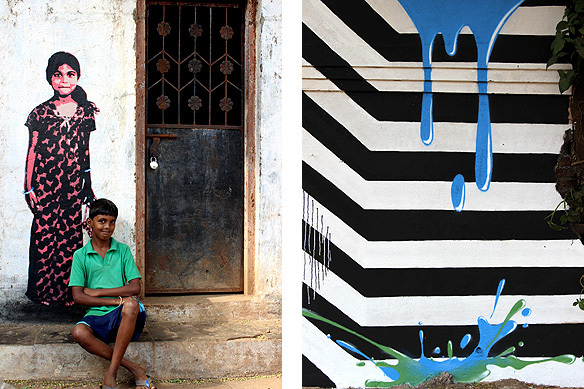 St+art India Foundation is a non-profit organization that aims to promote street art on the Indian landscape, providing a collaborative platform for artists from all over the world. 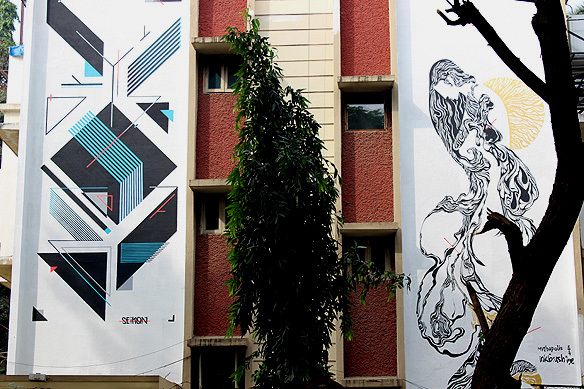 Founded by Delhi based Arjun Bahl and Hanif Kureshi, the St+art project brings together some of the best Indian and international street artists for murals, installations, exhibitions, talks, screenings, workshops and curated walks. The paints are sponsored by Asian Paints. This entry was posted in Art and Me, Bombay aka Mumbai, Giving Back and tagged Akacorleone, Amitabh Kumar, Ano, Anpu Varkey, Arjun Bahl, Asian Paints, Bandra, Bond TruLuv, Celebrate Bandra, Daan Botlek, Dome, Gomez, Hanif Kureshi, Harsh Raman, Harshvardhan Kadam, Ink Brush N Me, Mumbai, Pali Naka, Public Art, Seikon, st+art, St+art India Foundation, Stencils, Street Art, Street Art Festival, Tika, Tofu, Tona, Urban Art, Yantr by Rama Arya. Bookmark the permalink. Hi! Lovely post and I’ve explored quite a few 🙂 But could not locate the first one! Please could you give me a lead on the location? Thank you Yashodhara. 🙂 The first mural is at Tail Waggers Pet Salon, 20A, 16th Road, Bandra, Palli Village. The mural is absolutely charming ! Am sure you will love it. You welcome. 🙂 Post the curated walk there’s been a few more murals put up in Bandra under the same initiative–MTNL building by Ranjit Dhaiya from Bollywood Art Project, and a couple in Chimbai Village: one by Bond and Daan Botlek, and another by Ano. You will recognise them by their respective styles. Do check them out too ! i want to get my college walls to get life into it … i need to contact yiu all how can i?? please let me now. thnk you very much again.. 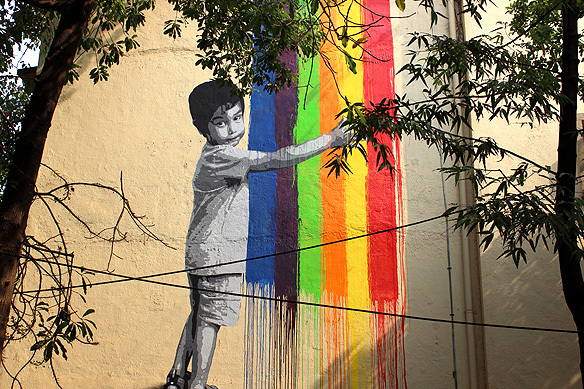 I cam across your piece while doing some research on Indian street art. I absolutely loved this post. 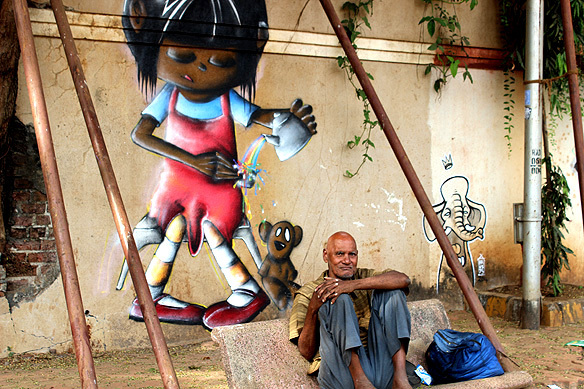 It’s wonderful to learn that Indian art is taking over the streets by storm. 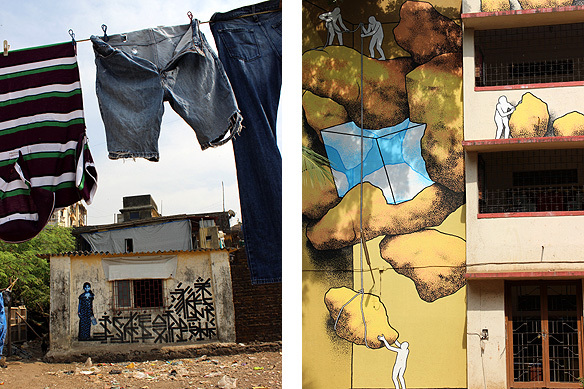 I had no idea that such beautiful art exists in Mumbai. Will make it a point to check it out when I visit the city next.